How About a Little Golf? ~ The Bucky Channel - The World of Sports from Wisconsin's Perspective. Home » Fred Couples , Golf , Jerry Kelly , K.J. Choi , Lee Westwood , Phil Mickelson , Steve Stricker , The Masters , Tiger Woods , Tom Watson » How About a Little Golf? If you're not a huge fan of golf that is okay, but any person that likes sports should have a little interest when the Masters come around. It is a great tournament at a really awesome, and nice golf course. This year everyone is talking about Tiger Woods who had some personal issues last November. We will talk about him later, but first I would like to give a shout out to some Wisconsin golfers. 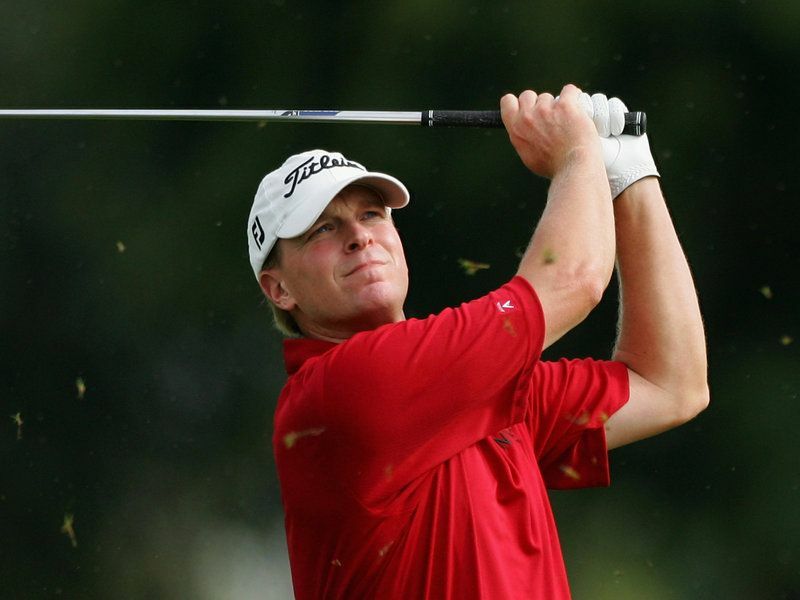 The man in the picture above is Steve Stricker, and he has been on fire as of late on the tour. He had a great ending to last year, and has some top ten finishes this year. Right now he is the number two ranked golfer in the world, so he is really at the peak of is career. Steve Stricker was born in Edgerton, Wisconsin, but did attend the University of Illinois. Still he was born in Wisconsin, so he has Wisconsin blood. He had a rough opening round Thursday as he bogied the easy par 5 hole two. It seemed that a lot of people were either getting eagle or birdie at number two. At worst people would par it, but not to many people that are still in the hunt got a bogey on number two. Stricker was one of those people, but after that he came back with a birdie on the par 3 hole four. After that he would post one more bogey, before paring out the back nine to finish 1 over for the day. It was windy out, but my guess is that Stricker wishes he would have played a little better. He was hitting fairways as he was 10-14 on the day, but he only hit 10-18 greens in regulation. He will tee off in the later group Friday so maybe the weather will be good for him to get back into this thing. Another Wisconsin native is Jerry Kelly who was born in Madison, Wisconsin. He is not as big of a name as Steve Stricker is, but he still can still be a competitive guy on the course. Any person that qualifies for the Masters must be a top golfer. Kelly had a little more active day with birdies, and bogies. After all his hard work Thursday he finished the day even par. His driving was awesome as he hit 13-14 fairways, but much like Stricker he only hit 11-18 greens. The irons really hurt these two guys today, but this is a course where you can put up a low number so these guys are still very much in it going into the second round Friday. As for the leaderboard, well this is kind of a turn back the clock Masters. Fred Couples is leading the way at 6 under, but right behind him is Tom Watson at 5 under. Couples is 50 years old, while Watson is 60 years young. These are names you would expect at the top in the 90's, but it is 2010 and these guys are still giving everything they have. I love seeing these names on the top of the board, because they are the ones that started making a name for golf. Some other well known names at the top of the leader board are Phil Mickelson at 5 under, Y.E. Yang at 5 under, K.J. Choi at 5 under, and Lee Westwood at 5 under. All guys that I believe have a shot to win this thing come Sunday afternoon. Other than the two Wisconsin boys, and the two old guys that are playing like they are young again, I'm watching two people. Tiger Woods and Anthony Kim, who are both at 4 under after Thursday of the Masters. I have always liked Tiger, and I really want to see how he plays with all the pressure of his off the course actions. Kim on the other hand is a guy that everyone should like, because no matter how he is doing he always seems to have a big smile on his face. He just plays the game, and doesn't let the game play him. Kim is also coming off his first win since 2008 last week, so he does have a hot hand coming into this week. Tiger on the other hand posted his best first round score in his Masters career. So this might have been the most exciting Thursday in Masters history with all the different story lines, but the biggest story line of them all is that 15 people are within 3 strokes of Fred Couples who is in the lead by himself. Sounds like it is shaping up to be a great weekend at Augusta National Golf Club. Do yourself a favor and catch a little golf this weekend if you can.